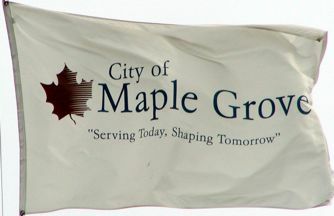 A white flag with a brown maple leaf toward the hoist and City of Maple Grove and the motto "Serving Today, Shaping Tomorrow" written on it. Maple Grove is a city in Hennepin County, Minnesota, United States. The population was 55,000 at the 2005 census.